Since the early 60s, apples covered in sweet, rich caramel have been a staple at parties, carnivals, and parades. Gooey, warm caramel perfectly coated around tart juicy apples make a treat that is hard to resist. We understand the alluring flavors blended together in these treats which is why we created this delectable cheesecake. 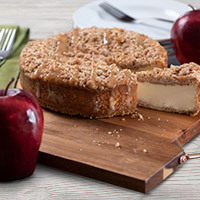 Baked in a graham cracker crust, packed with ripe apples, and topped with caramel crumbs, these desserts reinvent the original dessert in a way that's more appropriate for all occasions.